*the only person to finish the race every year it has been held. *the only woman to ever compete in the race. *the only American to run the race in a field of 14 people from around the world last year in 2008. This monumental race held over a 51 day period in Queens, New York is the longest certified road race in the world and is hosted by the Sri Chinmoy Marathon Team. The Spirit of a Runner is a documentary about Suprabha’s ultra-running career – especially her years of participation in the 3100. The film also offers a window into the race itself and the inspiration from the Marathon Team’s founder Sri Chinmoy. I was so inspired by this film that it brought me to tears while watching it. The next morning I woke up full of enthusiasm for life in general and for being a part of the Sri Chinmoy Centre in particular. It translated into a marathon-length (for me!) session of meditation where our centre gathers in Queens, New York. I meditated at home starting at 5 am then continued at the outdoor meditation area we call Aspiration-Ground from 6 to 9 am. The meditative morning brought a harvest of joy, gratitude and peace. Now some might say why didn’t the film inspire me to get up early and go running instead of to sit and meditate? I can only answer – good point! Maybe tomorrow it will energize my athletic activities instead of my meditation. Related: Photos I took of Suprabha on the race course during the 2007 3100 Mile Race. 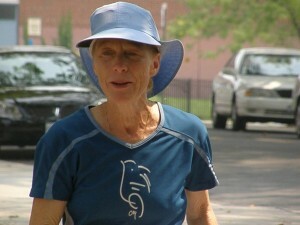 Thank you for posting the news of the new film featuring The 3100 Mile Race and Suprabha. The trailer is beautiful and I can hardly wait to watch the entire film. I hope you do get to see it – Nirmala comments here that she also found it quite beautiful when she watched it in Germany. What a pleasant surprise to hear from you! I will have to go out and buy some asparagus and think of Germany in May. It’s not quite in season yet here as far as I can tell although I did put in my vegetable garden Memorial Day weekend. respect- you inspire us all-where can i find this documentary? I know it showed recently at The Panorama of My Silence-Heart Cafe in Jamaica, Queens, New York. I’m not sure precisely where else it is airing. If you live near a cafe or shop run by students of Sri Chinmoy, I would inquire there if they know of it being shown. Hopefully it will air on television as well eventually.